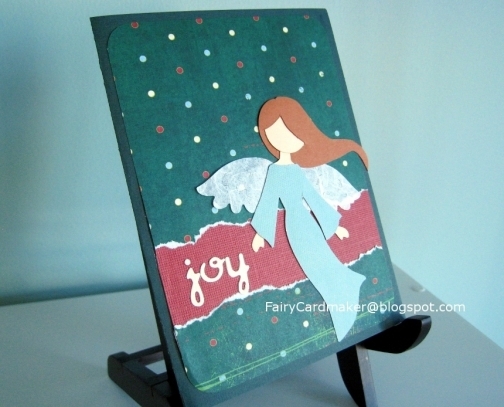 This handmade joy angel Christmas card features an angel in a turqoise dress. 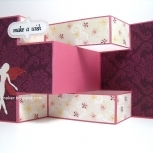 The background is green with colourful polka dots broken up by a rich red cardstock strip. 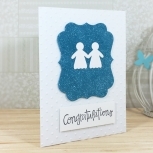 The “joy” sentiment is made with die cut letters. The angel was hand-drawn and hand-cut by me. Her wings are die cut from a mulberry-type translucent paper. The back of each card bears a shop label, signature and creation date. The white text in the picture is not on the actual card. Fairy Cardmaker, a division of Ensorcelled Minds Inc., is *not* responsible for any self-assesment provincial taxes or duties and/or customs levies that your location requires. It is the buyer’s responsibility to know when and how to self-assess and report, where applicable.